“I need more balance in my life” …. What does this mean? What is ‘out of balance’ ? What would your life be like if you had more balance? Important questions to ask yourself for sure. Before going any further down this path of seeking balance, let me just say, I am not a fan of finding balance. I do not believe it exists. 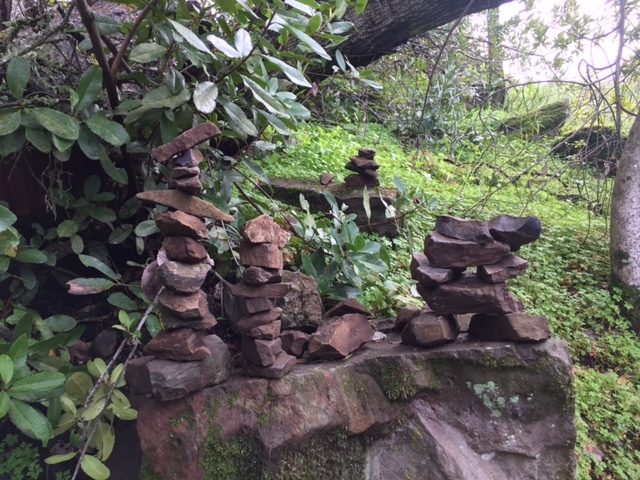 Oh, it exists when we balance stones on top of each other, or stand up straight on a balance beam in gymnastics or balance our checkbook, or perhaps attempt to balance a scale as we weigh ourselves….but balancing our lives? That is a tall order that I do not believe exists. For most of us, especially if we work and have a family, our lives are a bit chaotic, hurried, overloaded, hectic, busy, turbulent and crazy – especially these days! Attempting to find balance is an insatiable pursuit, that leads most of us feeling incompetent, more overwhelmed and deficient. Why can’t we just balance our lives? Why can’t we find more time for ourselves, for our partner, for exercise? If only we were more efficient with our time, if only we had more family support, if only we had a better paying job with less hours, if only…. The answer is not in doing more or trying to balance something that inherently does not balance. How can there be “an equal distribution of weight” when we have a deadline for a big project at work at the same time our little one comes down with strep throat and our partner has a trip out of town? How can we balance our life when we carve out time for a recovery meeting or even a spin class and as we are walking out the door, with no time to spare, our teenager yells, “I’m sorry mom, there is no gas in the car”! How do we balance the weekends when it is our only time to do laundry, clean the bathrooms, sleep in (ha! ), help with the science fair project, go to dinner with the grandparents who are only in town for one night, go grocery shopping, plan meals for the week, go to the mall for prom shoes, make a call to a Senator to oppose some recent legislation or another, go for a hike, spend quality time with our spouse, and meditate because that’s what the latest medical research shows will keep us sane and healthy ? Tell the truth about the chaos. Look around and assess what is happening – not from a judgmental place, but from a place of ‘noticing’ and gathering information. What is your daily life really like ? How many activities do you try to squeeze into one day ? What gets done usually and what usually doesn’t get done ? Take stock. Tell the truth. Do not judge yourself, simply notice the chaos, the activity, the down-time, the ‘incompletes’ and ‘completes’. Do not change anything. This is not about making changes, doing more or less. This practice is about being with what is your life today and finding peace. There may be another time when you decide you want to simplify or complicate your life but this is not today. Breathe. Seriously, stop right now and just take a long, deep breath. One of the most important, life generating practices you can implement, right now is to remember to breathe. When we stop to breathe, we stop, we focus and we nourish ourselves. One, long, deep luxurious breath. Now. Look around….if you are alone, find one thing that makes you smile, brings you joy. Perhaps it is a flower outside your window or a brand new coffee mug your daughter gave you…maybe it is the vacuumed carpet or the dusted coffee table….maybe it is a photograph on the wall. Notice. Breathe. Feel the joy, pleasure, contentment. Take in the colors, sounds, feel of the item. Breathe. Look around...if you are with your family, find one thing that makes you smile, brings you joy. Push the pause button on whatever you are doing and watch, notice, take in what others are doing. Notice the chatter, the laughter, the screaming, the playing, the texting. Take it in. What do you notice? What do you appreciate ? Just for that moment, what brings you joy ? Maybe your daughter is texting on her phone and you can just smile at her rapt attention and her beauty as she looks up at you watching her. Maybe your son is working on his homework with your husband and you notice how patient your husband is being despite how stubborn your son is and you smile, appreciating this moment captured in time of two people you love so much doing their best. You smile at your son’s unruly hair, loud voice and your husband’s sigh of exasperation. Appreciate the moment, just the moment. Take in the colors, sounds, the feel of this moment. Breathe. If you are so inclined, find a song or a piece of music that lifts your spirit, that makes you smile, and play it for yourself …listen with your whole being, take it in, feel it in your body as you listen. And, perhaps you play this music in the background as you go about your day, reminding you to seek harmony, not balance. Finding peace amidst the chaos is learning to breathe, notice, take in the good, and breathe again. Reset. The more times we take in the joy, amidst the chaos of our lives, the more peace we have in our heart. There is nothing to balance, nothing to squeeze in, add to our day, take out of our schedule. The more we try to balance our lives, the more inept and incompetent we feel. Most of us already feel ‘not enough’ or ‘not good enough’ and not being able to find balance is just another way we beat ourselves up. Maybe someday you will want to find time for a date night with your partner or carve out an hour every day to go to the gym…maybe you will want to hire a gardener to give you an extra few hours on the weekends for a trip to the beach or a hike or a nap….but until then….I invite you to bring more peace into your life, with moments of peace, moments of joy, moments of appreciation amidst the chaos! And breathe.